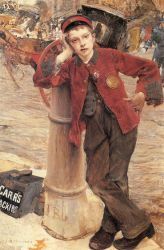 Jules Bastien-Lepage (November 1, 1848 – December 10, 1884), French painter, was born in the village of Damvillers, Meuse and spent his childhood there. Bastien's father grew grapes in a vineyard to support the family. His grandfather also lived in the village; his garden had fruit trees of apple, pear, and peach up against the high walls. 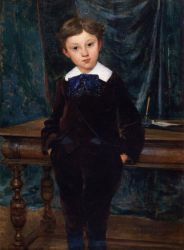 Bastien took an early liking to drawing, and his parents fostered his creativity by buying prints of paintings for him to copy. 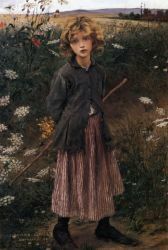 Jules Bastien-Lepage (pronounced zhewl bahss tyan le pahzh) first studied at Verdun, and prompted by a love of art went in 1867 to Paris, where he was admitted to the École des Beaux-arts, working under Cabanel. 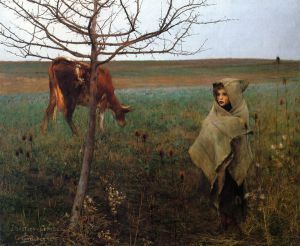 After exhibiting in the Salons of 1870 and 1872 works which attracted no attention, in 1874 he made his mark with his Song of Spring, a study of rural life, representing a peasant girl sitting on a knoll looking down on a village. His Portrait of my Grandfather, exhibited in the same year, was not less remarkable for its artless simplicity and received a third-class medal. When the Franco-Prussian war broke out, Bastien fought when men were needed for the troops. Bastien was a man by this time, medium height and stout. After the war, he returned home to paint the villagers. 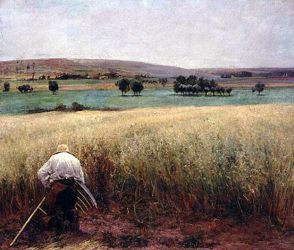 In 1873 he painted his grandfather in the garden, and this painting later became a favorite for many art lovers for its true-to-life qualities. 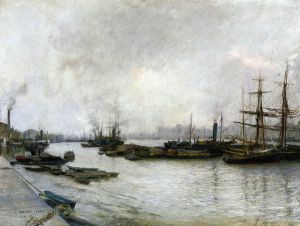 In 1873 he was also commissioned to paint the Prince of Wales. This success was confirmed in 1875 by the First Communion, a picture of a little girl minutely worked up as to color, and a Portrait of M. Hayern. In 1875 he took the second Prix de Rome with his Angels appearing to the Shepherds, exhibited again in 1878. His next endeavour to win the Grand Prix de Rome in 1876 with Priam at the Feet of Achilles was again unsuccessful (it is in the Lille gallery), and the painter determined to return to country life. 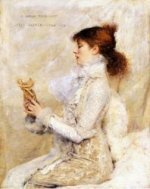 To the Salon of 1877 he sent a full-length Portrait of Lady L. and My Parents; and in 1878 a Portrait of M. Theuriet and The Hayfield. The last picture, now in the Luxembourg, is regarded as a typical work from its stamp of realistic truth.